I'm pretty excited about women's fashion trends this season. For one, showing less skin is in vogue (according to this LA Times article I read recently, "skirt lengths [are] falling in concert with the stock market") and clothing is comfortable again. Really comfortable. Maybe even baggy. And when I have to chase my 18-month-old up some crazy, grassy hill at the park, I am down with the baggy. 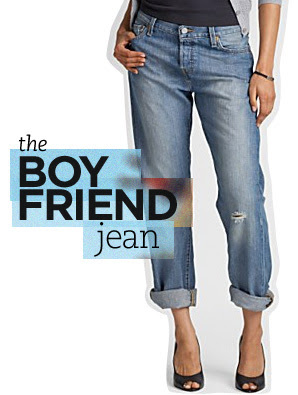 So, to the new trend that is called 'boyfriend jeans,' I give you the thumbs up. What do you think of this trend? Pass, or fail? I like them but if only I was skinny like them. Do they have maternity boyfriend jeans? I must be cool. I've been wearing my jeans like this in the summer for years. Cracks me up.I grew up on a ranch in Oklahoma. We all had these jeans, maybe even worse-I mean better, LOL! But they sure were not worn into town! Sweet! I am in fashion!! :) Love the realistic look. And it won't break your bank, too. Though, I really have to move away from tshirts. cool. i've been with the trend all during post-pregnancy. i guess i don't have to give away those tattered jeans that are loose on me now. I should probably pick up a couple pairs as mine are pretty thread bare!